Police in Paris have deployed tear gas against demonstrators and refugees who protested the authorities’ decision to evict at least 277 asylum seekers who had been living in a high school under renovation for about two weeks. 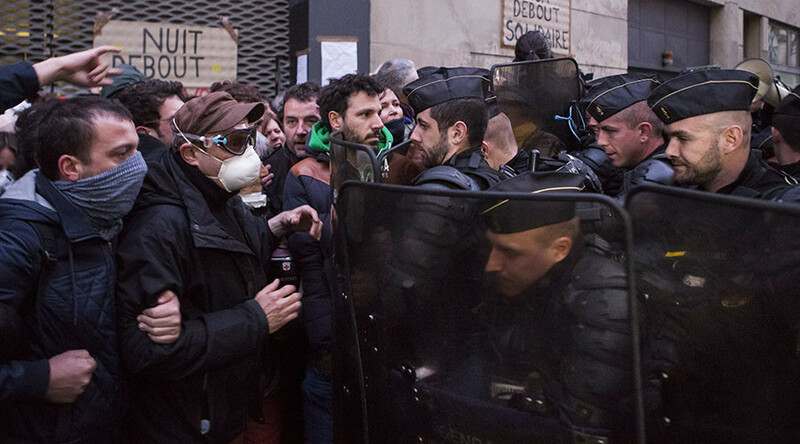 The demonstrators, some of them wearing masks and hoods, formed a human chain to prevent police officers from entering the building of Jean Jaurès School, French media reported. “Everyone hates the police,” and “Solidarity with Refugees,” protesters chanted, before starting to throw objects at police, an AFP correspondent at the scene said. Police, in turn, deployed tear gas against the demonstrators. When they finally managed to enter the school, they faced a barricade made of chairs and tables piled up to block them. "This morning the police gassed us and pushed us out of the way. At midnight we built a barrier of tables and chairs, but they moved it all out of the way," Emmanuel, a Ghanaian refugee who resided in the school, told AFP. In the end, police managed to evict all 277 refugees on several buses. Some of the protesters reportedly were trying to block the buses to prevent refugees from entering them. “The high school, which is governed by the Regional Council, is not intended to be a shelter for migrants or foreigners,” said Michel Cadot of the Paris Police Prefecture. Among those evacuated there are 74 people (including 20 women and 6 children) who were taken to refugee centers, Paris Police Prefecture said. More than 200 others have been “taken to examine their administrative status,” it added. The refugees started occupying the school on April 21-22. Most of them were from Afghanistan, Eritrea, Somalia, Sudan and Yemen. There were also people from Syria. “There are a lot of women among the migrants in the school, including two who are pregnant,” Clementine Verschave, from a migrant charity group, told AFP. The eviction in Jean Jaurès School is not the first official action taken by French authorities against asylum seekers. On Monday a huge migrant camp under the Stalingrad metro in Paris was evacuated. The camp with hundreds of asylum seekers earlier saw fierce battles between refugees.